Have you ever wanted to be in two places at once? Have you ever wished you could teleport? If you’re managing a nationwide kiosk network with potentially thousands of units then the answer is probably “yes”. Controlling vast kiosk estates is a challenging task at the best of times, but when your knowledge of each machine is limited, out-of-date or non-existent this becomes an impossible task. Which machines are out of order? Have any machines run out of printer roll? How much cash is in each machine? To avoid you having to say “I don’t know” Genkiosk provides all this information (and more) from the comfort of your office. Genkiosk allows you to monitor the status of each of your machines without the trouble of going to visit it. Kiosk usage figures, unit performance and revenue, cash levels – things you need to know for effective control – are all available through the Genkiosk software. 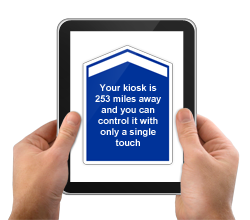 With Genkiosk, all your machines are connected all the time providing information that is relevant at the time you’re viewing it and is accessible to as many users as needed. All major stakeholders will be able to gather this information without the need for you to create and distribute those time-consuming reports. Control means knowing what is going on and being able to do something about it; i.e. keeping in touch. This is what Genkiosk provides.